At present, agriculture is a most demanding and famous stream among the students for pursuing the higher education. Candidates can pursue undergraduate, postgraduate and doctoral level courses in this field. To get the admission into Agriculture courses, candidates have to qualify All India Agriculture Entrance Exam. 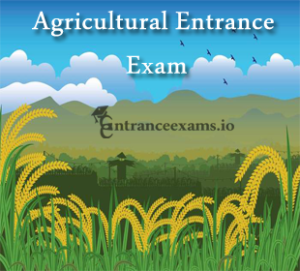 The List of Agricultural entrance exams updates here. Check National, State wise, university level entrance exams here. Agriculture is the backbone of an economy which provides the basic ingredients to mankind & raw materials to the industries. The main source of livelihood is “Agriculture” for many people. As 70% of the people depend on agriculture as a mean of living, Agriculture is the source of national income for most of the developing countries. Candidates who have passed 10+2 from a recognized board with the science background are eligible to get the admission in B.Sc Agriculture. We have provided here a list of Agriculture Entrance Exam that are held at the state level as well as National & University level. The National Level Agriculture Entrance Exams are listed here. Aspirants who are willing to get the admission into agricultural courses can attempt the entrance exams. Full Form – Indian Council of Agriculture Research. The Authority of Indian Council of Agricultural Research organizes this test for admissions in UG and PG courses in the fields like Engineering, Agriculture and other fields. ICAR Conducts the tests separately for UG and PG Courses namely ICAR AIEEA UG and ICAR AIEEA PG. It is conducted for Bachelor Degree programs (UG) in Agriculture and allied subjects, other than veterinary sciences. Nearly 15% of the Agricultural Universities seats are occupied through AIEEA UG 2018. Through AIEEA PG Entrance Exam 2018, the officials offer the master’s degree courses offered by the Agricultural Universities/Institutions. State Level Agriculture Entrance Exam list as follows. Carefully, check the list of State Level Agriculture Entrance Exams. The list of State wise Agriculture CET Exams is tabulated below. Bihar Combined Entrance Competitive Exam Board organizes the BCECE Exam which is a Bihar State Level Entrance Exam. Through BCECE Exam, the admissions are provided into undergraduate courses in the field of Pharmacy, Engineering, and Agriculture in Bihar state. JCECE is a Jharkhand State CET Exam. Jharkhand CECE Exam is the gateway for the aspirants to get the admissions into undergraduate engineering, agriculture & other courses. Through JCECE Exam, candidates will get the seats in first-year degree level professional courses in the field of agriculture, forestry, and Medical (BHMS). Through Kerala CEE Exam, the officials will offer undergraduate & post graduate courses in various fields such as Engineering, Agriculture, Pharmacy and many others. The admissions are provided into various courses such as B.Sc (Hons), BVSc, and AH, etc offered by the institutions/colleges of Kerala State. Every year, JNTU Hyderabad on behalf of TSCHE organizes the exam. TSEAMCET is a Telangana State Level Entrance Exam conducted to provide the admissions into the first year of various UG programs in the field of Engineering, Agriculture & Medical. Andhra Pradesh EAMCET is an AP State Level Entrance Exam organized by JNTUK on behalf of APSCHE. Through EAMCET, candidates can grab the admissions in undergraduate courses in the field of Engineering, Medical & Agriculture. KCET is a Karnataka State Entrance exam. Through KCET Exam, candidates can get the seats into various courses such as Engineering, Technology, Architecture, Medical, Dental, Farm Science, etc. Aspirants can grab the admissions in BSc (Agriculture, Sericulture, Horticulture, Forestry), BSc Agri Bio Tech, BHSc (Home Science), BTech (Agri Engg, Food Technology, Dairy Tech, Food Science &Tech), BFSc (Fisheries), BSc (Agri Marketing & Co-Op), etc. MP PAT is a Madhya Pradesh State Level Entrance Exam for the admissions into B.Tech (Agriculture Engineering), B.Sc (Agriculture, Horticulture, Forestry, Agriculture Engineering) in various colleges in MP. B.Sc Agriculture (honors) is one of the Agriculture Entrance Exam widely explored in the present days. The reason is due to the growing importance of agriculture and benefits of adding technology to it. The study under B.Sc Agriculture includes utilization of various technological aspects for the betterment of agriculture. Also, includes the study of various methods of agriculture, the use of modern fertilizers for the improvement of crops and the ways to improve the present technique of agriculture with the help of Modern Technology. Agricultural education includes the teachings regarding agriculture, natural resources, and land management. The courses that are taught under the umbrella of agricultural education are essential for the students in many ways. Stay tuned to our page entranceexams.io for more updates regarding Agriculture Entrance Exams Dates & Notifications, etc.